The preliminary meeting of the Technical Working Group (TWG) on Stakeholder Engagement and Safeguards for REDD+ in Myanmar was held in Nay Pyi Taw on 29 October, jointly organized by Forestry Department of the Ministry of Environmental Conservation and Forestry, and coordinated by the UN-REDD Programme team in Myanmar. Twenty-one representatives participated the meeting, including from five different departments of concerned ministries, three Civil Society organizations (CSO), advisors from UN-REDD Programme’s regional team based in Bangkok and the national team in Naypyitaw. This first meeting, chaired by U Ngwe Thee, Assistant Director for the Forest Department of the Ministry of Environmental Conservation and Forestry, focused on the development of a preliminary work plan, engagement of all members of the TWG for future work, and planning for effective communications with all relevant REDD+ stakeholders in Myanmar. With funding support from Norway’s Government through the UN-REDD Programme, the prioritized activities of the Myanmar REDD+ Roadmap were developed in 2013. The Forestry Department of the Ministry of Environmental Conservation and Forestry is the Implementing partner of the UN-REDD Programme in Myanmar. 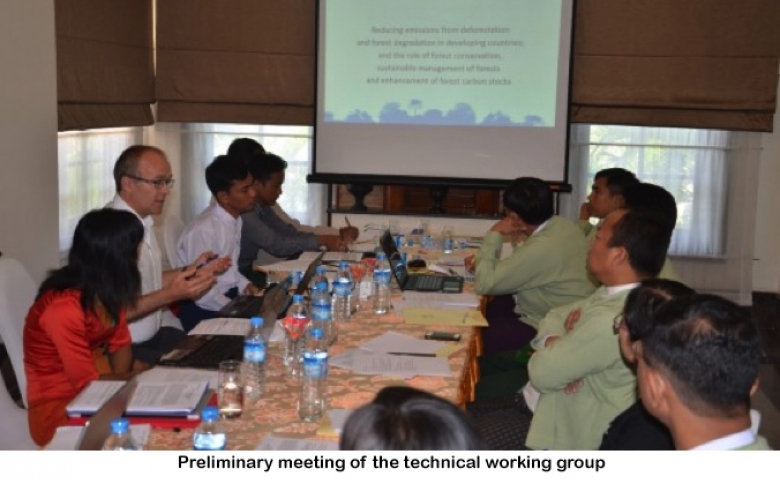 Both during the preparation of the REDD+ Readiness Roadmap and as Myanmar starts to prepare for REDD+, there are three Technical Working Groups to guide the process. Besides the Stakeholder Engagement and Safeguards groups, there are also TWGs on Strategy and Drivers, and Monitoring and Reference Levels. The main role of the TWGs is to develop proposals and options related to the future National REDD+ Strategy and mechanisms for its implementation. The Stakeholder Consultation and Safeguard Technical Working Group focuses on enhancing and encouraging active engagement of all stakeholders in the readiness process. An immediate task the TWG is to consider how to promote improved collaboration on communication materials on REDD+ among all partners. This will involve translating and revising existing communications and outreach to other actors involved with REDD+ and REDD+ related activities in Myanmar. This meeting discussed processes for ensuring rapid progress on these activities. The second task for the TWG is the development of stakeholder engagement guidelines for REDD+ in Myanmar. A third task will be the development of a Communications Strategy for REDD+ in Myanmar. For all the above mentioned tasks, the TWG can build on the work done when developing the REDD+ Readiness Roadmap as well as experiences from other countries, including guidance developed by the UN-REDD programme such as the guidance on stakeholder engagement and development of the communications strategy. REDD+ is a mechanism proposed under the United Nations Framework Convention on Climate Change (UNFCCC) to achieve significant reductions in anthropogenic emissions of greenhouse gases globally, thus contributing to international efforts to mitigate the impacts of climate change.